Traffic control standards aren’t only regulated by federal and state requirements, they also must respond to field conditions. Wherever there’s a need for traffic control, traffic control providers must evaluate the needs of the job and apply the appropriate setup standard. Applying standards and maintaining quality work zone setups requires the ability to read the landscape and adjust to field conditions. How the shoulder of the road, the curve of the road, and obstructions like trees or permanent signs will impact how the typical is applied must be considered. The real-world conditions cannot be ignored, and written standards must be interpreted through experience and common sense in the field. There are an endless number of factors that play into how a work zone is set up in real field conditions. We are going to share some common factors found in urban environments and suggest some options on how to adjust sign placement to maintain a quality, safe setup. For instance, we must always remember that in a low speed, urban area, there is less spacing between signs. Sign placement in an urban landscape is often tricky because space around the roadway is constrained and there are many objects that can obscure advanced warning signage. 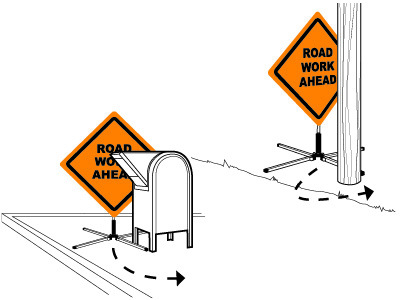 On the flip side, poorly positioned work zone signage can obstruct movement of pedestrians, parking cars, or even important lines of sight for motorists. 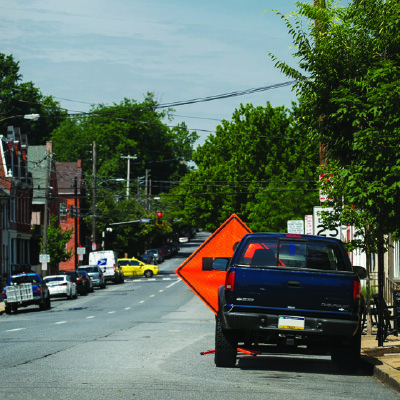 Adjusting to field conditions in a city is often a chess game between meeting the traffic control standards and the needs of those that live and work near the work zone. A good traffic control partner knows it’s their job to be sure that neither side loses. Operating in an urban environment means more stuff—more cars, people, buildings, etc. that are out of your control. It’s important to recognize these challenging obstacles to ensure what you can control is in a safe, well-seen location. Signs should never be blocked by static objects such as trees, bus stops, and mailboxes. This also includes parked cars and other stationary objects that can prohibit a sign from being seen. 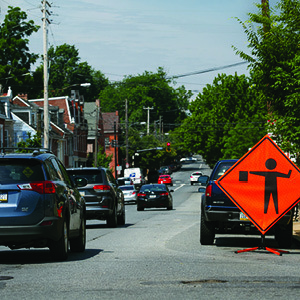 Urban areas are often more crowded and present additional areas of concern on where to place signage when setting up a work zone. It’s important that field crews remember to pay attention to extra busy areas and stay mindful of the traffic on and off the road. 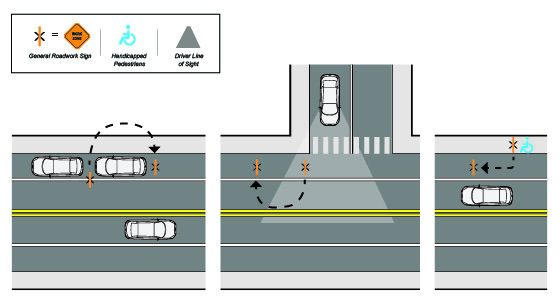 As shown in the image above and in the left-hand diagram below, signage can impact the roadway when placed between two parked cars. The sign needs to be moved to the shoulder/parking area behind the parked car, away from impacting the roadway. The middle section of the diagram below represents signage obstructing driver view. The sign placed at the corner needs to be moved to the area outside of the blind spot. In the right-hand diagram below, the sign shown on the right is impacting pedestrians. The sign placed on the sidewalk needs to be moved to the shoulder/parking area, while not impacting the roadway. 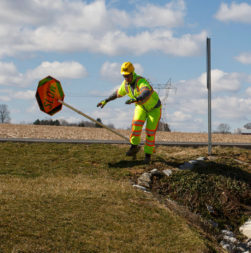 Traffic control standards aren’t only regulated by federal and state requirements, they also must respond to field conditions. There are an endless number of factors that play into how a work zone is set up in real field conditions. We are going to share some common factors found in urban environments and suggest some options on how to adjust sign placement to maintain a quality, safe setup.